L'Herbier Parfumé: Histoires Humaines des Plantes à Parfum by Freddy Ghozland and Xavier Fernandez (with an introduction by Elisabeth de Feydeau and 36 perfumers discussing 36 perfume ingredients) is a perfume nerd's dream come true. If you've gotten to the point where you actually care what notes are in a perfume and want to deepen your understanding of the particulars of a perfume's notes, this is the book for you. Unless you're fluent in French, however, The Perfumed Herbarium might be a bit daunting. You could approach the language hurdle the way I'm doing it now. I still remember some French from high school, so I pick an ingredient or two a day, grab a dictionary — or Google/translate — and work my way through the translation. Sometimes, Google/translate will garble things (an actual translation: "his rhizome is about 2.5 cm thick"), but if you use common sense, you can muddle your way through. The Perfumed Herbarium starts off with a 35-page introduction written by Élisabeth de Feydeau called "The Story of Perfume and Its Use in Human Societies," with historical information about aromatherapy in Egyptian antiquity, a history of distillation methods, and an explanation of headspace technology. 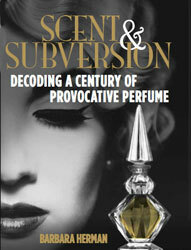 This section is illustrated with historical images, vintage photos, and pictures of beautiful perfume bottles. As a perfume lover who has never had any formal training in perfume appreciation, this kind of insider perfume knowledge gets me all hot under the collar. Maybe the next time I smell cheese, cut grass, or the smell of laundry soap, I'll say, "Ah ha! Butyric acid? Cis 3-hexanol? an overdose of dihydromyrcenol?" Hey, it may come in handy! This is accompanied by a full-page photo of the plant, followed by a two-page explication of the ingredient's use in perfume by someone in the industry. (Perfume-lovers will recognize Maurice Roucel on basil; Dominique Ropion on the cassie flower [Acacia farnesiana]; Michel Almairac on cedar; Mathilde Laurent on mint; Jean Kerléo on osthmanthus; Patricia de Nicholai on patchouli; Olivier Polge on styrax; Francis Kurkdjian on vetiver; and Jean Guichard on ylang-ylang.) You're getting schooled by the experts, in other words. For example, I learned the following about one of my favorite perfume ingredients, artemisia, or mugwort: the leaves smell like absinthe; its English name refers to its historical use as an insect repellent; and Hippocrites considered it a "feminine" plant. Named after Artemis, the Greek hunting goddess, artemisia was used in antiquity to regularize menstrual cycles and aid in childbirth. It can also be found in some of my favorite perfumes: Cabochard, Aromatics Elixir, Bandit and Diorella. In addition to getting an education from expert noses, there is the (admittedly geeky) thrill of seeing pictures of actual perfumers (swoon!). Some of them are stately and distinguished looking, and others are just straight up hotties: Francis Kurkdjian, Aurélien Guichard, Karine Dubrueil, and Mathilde Bijaoui — I'm talking to you! I have a couple aromatherapy books that discuss essential oils, and Bo Jensen's site is amazing, but L'Herbier Parfumé tackles the subject from a specifically perfume-centric perspective that's also conversational in a way that I appreciate. It's more of an encyclopedia than a book, so who knows when I will actually get through it. I'm taking my time though. I'm going to savor L'Herbier Parfumé as if it were a Rabbit Casserole with Cream Sauce and Immortelle Petals. Why not live a little? For me a Christmas without books (AND perfumes!) is not worth the trouble - so this will be a book for me for sure. THANK you so much for finding it AND writing about it ! You'll love it, Gardenfairy. It's beautiful, educational, and fun. Their other books look great, too...Let me know if you get it! Re: the whiffy paper in the beautiful book - maybe put blotting paper with the appropriate scent in between the relevant pages, building up a scent library to overcome the paper smell, to give you a better experience when browsing? It might make for a positive outcome from a negative situation? This sounds wonderful , I will have to use translator too alas . It might be the glue you can smell . Anna's suggestion is a great idea. So glad you got the book, Martina! I have so much fun reading/translating it. And I'm definitely going to contact you about your news. You've got me curious!